9to5to9: Not afraid of the principal? What the duck? The second I saw him at kindergarten orientation, I suspected that Big Guy’s grade-school principal was dangerous. I didn’t realize how dangerous until today, when Mr. S deliberately and systematically dismantled the last weapon I had to get Big Guy to school on time — the threat of the principal’s office. Big Guy’s punctuality has improved over the past few weeks since I made it his responsibility. He’s cut it close a few times, but at least the mad dashes are not longer tear-filled treks. Ay, but now he’s eager to go to the principals’ office. Because there are ducks there that light up like Christmas trees. And baseballs. And a guy, not much taller than some of the sixth-grade girls, who shares his toys with the kids. I thought of the principals of my school days and couldn’t fathom loving one. There was Mrs. Frazier, the gray in her bun almost as steely as her eyes. Mrs. Mullen wasn’t bad, but it was easy even for a kid to catch the undertones of the PTA moms’ issues with her Dolly Parton-esque build and her penchant for mini skirts. Mr. Crandall also served as the lunch police, making sure everyone cleaned their trays. I always did, thanks to the help of a friend skilled at covertly scooping over-sugared commodity apricots into our empty milk cartons. It was a different era, one where authority ruled through fear. Love the principal? I tried to steer clear. It is impossible to steer clear of Mr. S. He hugs. He high fives. He scrunches himself into kiddy-size tables and eats lunch with the students. He bounces from the kindergarten classes on one end of the campus to the cafeteria on the other, and this is a 700-student school. Oh, and the school’s test scores trail only the district’s magnet school and are above the state average — in many case, well above — in all but two categories. Not that test scores are the educational be all and end all. But they’re one measuring stick. The better barometer, though, was Big Guy’s pride as he rushed to pull the day’s haul out of his backpack this afternoon. That’s just swell. 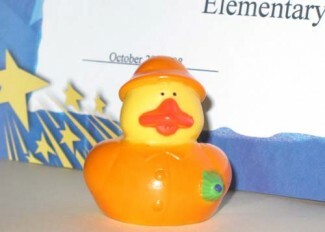 Now that Big Guy knows the principal’s office is a duck pond instead of a jail cell, I’ll never get him to school on time.